Leaving work today, I was startled by the usually serene view of Honolulu Harbor from my office building. A ginormous structure of some sort was parked at Aloha Tower, looming over the city like an evil alien space station. (Okay, it only loomed over Aloha Tower, but suffice it to say, this thing was huge.) Despite an irrational fear of being obliterated by a laser beam, I had to go check it out. 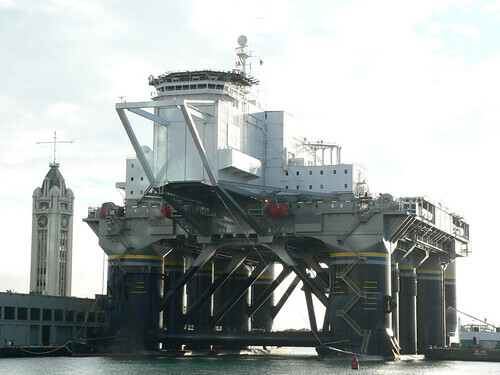 Turns out it’s the Sea Launch platform (see also its entry on Wikipedia), a $600 million vessel built to put rockets into space from the equator. Why? Putting it in the middle of the ocean at latitude zero makes for a shorter, cheaper, safer launch. Built by an international partnership and now managed by Boeing, the converted oil rig has hosted 24 rocket launches. The platform is based in Long Beach, Calif., but is stopping in Honolulu after rough seas delayed its current mission to put a Thuraya satellite into orbit. The current mission is also the first launch since a failed launch in January 2007. The rocket “experienced an anomaly,” which could be a bit of an understatement considering the video record. Check out the rest of my photos of this massive structure here.